Beau's All Natural has launched sales on a new “beer + music” series that will see new Beau’s brews or blends paired with limited edition vinyl records, and designed with unique artwork to create a true collector’s item. The first offering, called Dr. Jekyll and Mr. Hyde, is available now, direct from the brewery only. Only 5,000 of these gift boxes will be sold this fall — a new version is slated to be released annually each year in time for Hallowe’en celebrations. The package includes two 600 ml bottles of Beau’s beer created specifically for this release, and features the ghoulish work of visual artist Dirty Donny Gillies on its labels and box. An Ottawa native, Gillies' style has earned him commissions from some of music's most recognizable names including Metallica, Queens of The Stone Age, and Hellacopters. Gillies worked in tandem with Beau’s award-winning creative director Jordan Bamforth to create the special packaging for the release. The two bottles of beer included have been dubbed Dr. Jekyll & Mr. Hyde in honour of the Hallowe'en season release. 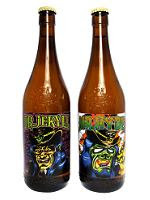 Dr. Jekyll is a blend of Beau’s flagship beer Lug Tread and the fall seasonal Nightmarzen. The delicately malty, slightly fruity character of Lug Tread meshes with the more intensely bready, biscuity backbone of Nightmarzen while restraining some of its hoppy intensity, and a burnished gold coloured beer is the result. A tribute to the Roggenbiers of Germany with a North American twist, Mr. Hyde is a deep copper colour, and is essentially a rye beer using predominantly German ingredients: a Roggenbier-meets-RyePA. Hopping is aggressive in the American vein, but again uses German hops to provide bitterness, flavour and aroma while the rye itself provides additional spiciness. Chris Rayburn - "Beau's Jingle"
Teenage X - "Chelsea Horror Hotel"
Elliott Brood - "Will They Bury Us?" White Wire - "Ha Ha Holiday"
The gift box retails for $18.85, and can be purchased from the brewery retail store while supplies last.